Taking a stroll through the woods in the midst of autumn is a stunning visual experience. It does, however, require one to live nearby a forest. If you are one of those who does not, [Koen Hufkens] has recently launched the Virtual Forest project — a VR experience that takes you though a day in a deciduous forest. First off, you don’t need a VR apparatus to view the scenery. Web-browsers and most smart phones are capable of displaying the 360 degree images. The Raspberry Pi 2-controlled Ricoh Theta S camera is enclosed in a glass lamp cover and — with the help of some PVC pipe — mounted on a standard fence post. Power is delivered ingeniously via a Cat5e cable, and a surge protector has also been included in case of lightning strikes. Depending on when you view the website, you could be confronted with a black screen, or a kaleidoscope of color. We see a lot of old radio restoration projects around here, and we have to admit to having mixed emotions about some of them. It seems a shame to go through the effort to lovingly restore a vintage Art Deco case only to stuff it with a Raspberry Pi and Bluetooth. Seems like if you’re going to restore a radio, go all the way and bring the original electronics back to life. But this radio “restoration” avoids that issue altogether by cleverly concealing a full PC build in a vintage radio case. Clearly a labor of love, [SolomonZaraa]’s two-year effort guts the radio but still manages to pay homage to the original beauty of the 1939 vintage Philco 39-80 “tombstone” portable AM radio. The first design decision was to retask the original tuning dial as an analog thermometer using an Arduino and a servo. Then a new back was added with an extension for the motherboard and PSU, a drive cage was added, and a surprise slot for the DVD drive was built into the speaker grille. Nice brass trim and a good refinishing of the case resulted in an impressive and unexpected presentation. You don’t have to go far in the Hackaday Wayback machine to find an antique radio with updated audio, but we’re pretty sure this is the first antique radio PC case mod we’ve seen. Nicely done, [Solomon]! Sometimes it’s not so much what you put together, it’s how you use it. The folks at Adafruit have put up a project on how to dress up your drone with ‘UFO lights’ just in time for Halloween. The project is a ring of RGB LEDs and a small microcontroller to give any quadcopter a spinning ‘tractor beam light’ effect. A 3D printed fixture handles attachment. If you’re using a DJI Phantom 4 like they are, you can power everything directly from the drone using a short USB cable, which means hardly any wiring work at all, and no permanent changes of any kind to the aircraft. Otherwise, you’re on your own for providing power but that’s probably well within the capabilities of anyone who messes with add-ons to hobby aircraft. One thing this project demonstrates is how far things have come with regards to accessibility of parts and tools. A 3D printed fixture, an off-the-shelf RGB LED ring, and a drop-in software library for a small microcontroller makes this an afternoon project. The video (embedded below) also demonstrates how some unfamiliar lights and some darkness goes a long way toward turning the otherwise familiar Phantom quadcopter into a literal Unidentified Flying Object. When you think of living off the grid, you often think of solar power. But if you’ve got a good head, and enough flow, water power can provide a much more consistent flow of electrons. All it requires is a little bit of engineering, epic amounts of manual labor, and some tricks of the trade, and you’ll have your own miniature hydroelectric power plant. [Homo Ludens], the playful ape, has what looks like a fantastic self-sufficient home/cabin in a beautiful part of Chile. His webpages are a tremendous diary of DIY, but the microhydro plant stands out. You might expect that building a hydro plant involves a lot of piping, and trenching to lie that pipe in, but the exact extent, documented in many photos, is sobering. At places, the pipe needed to be bent, and [Homo Ludens] built a wire-mesh pipe heater to facilitate the work — with the help of a few friends to weigh the pipe down at either end and create the bend. The self-wound power transformer is also a beauty. There’s a lot more detail here than we can possibly get into, so go check it out. And if you’re in the mood for more hydro, we’ve recently run a writeup of a less ambitious, but still tidy, project that you should see. Or you could just rip apart an old washing machine. Thanks [Patrick] for the great tip! Most data storage devices we currently use are, at their core, two-dimensional. Sure, a hard drive might have multiple platters, but the data storage takes place on a flat surface. Even an optical drive is effectively a single surface that holds data. At the City College of New York, they are experimenting with storing data in three dimensions using lab-grown diamonds and LASERs. Usually, diamonds that have few flaws are more valuable. But in this application, the researchers exploit the flaws to store information. Optical memory that uses a volume instead of a surface isn’t exactly new. However, it is difficult to use these techniques in a way that is rewritable. Diamonds are a crystalline structure of carbon atoms. Sometimes, though, a carbon atom is missing from the structure. That’s a vacancy. Another defect is when a nitrogen atom replaces a carbon atom. Sometimes a vacancy occurs next to a rogue nitrogen atom and that causes an NV (nitrogen vacancy) center. George [Geohot] Hotz has thrown in the towel on his “comma one” self-driving car project. According to [Geohot]’s Twitter stream, the reason is a letter from the US National Highway Traffic Safety Administration (NHTSA), which sent him what basically amounts to a warning to not release self-driving software that might endanger people’s lives. This comes a week after a post on comma.ai’s blog changed focus from a “self-driving car” to an “advanced driver assistance system”, presumably to get around legal requirements. Apparently, that wasn’t good enough for the NHTSA. When Robot Cars Kill, Who Gets Sued? On one hand, we’re sorry to see the system go out like that. 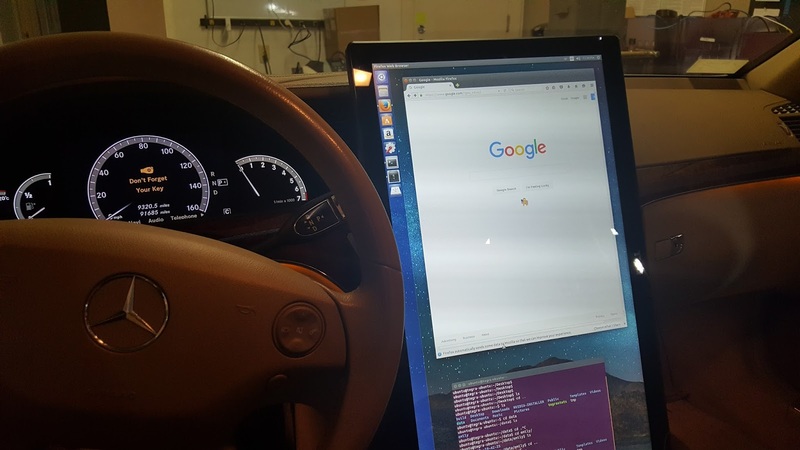 The idea of a quick-and-dirty, affordable, crowdsourced driving aid speaks to our hacker heart. But on the other, especially in light of the recent Tesla crash, we’re probably a little bit glad to not have these things on the road. They were not (yet) rigorously tested, and were originally oversold in their capabilities, as last week’s change of focus demonstrated. Comma.ai’s downgrade to driver-assistance system really begs the Tesla question. Their autopilot is also just an “assistance” system, and the driver is supposed to retain full control of the car at all times. But we all know that it’s good enough that people, famously, let the car take over. And in one case, this has led to death. Should We Take a Step Back? Or a Leap Forward? Stepping away from the law, is making people inattentive at the wheel, with a legal wink-and-a-nod that you’re not doing so, morally acceptable? When many states and countries will ban talking on a cell phone in the car, how is it legal to market a device that facilitates taking your hands off the steering wheel entirely? Or is this not all that much different from cruise control? What Tesla is doing, and [Geohot] was proposing, puts a beta version of a driverless car on the road. On one hand, that’s absolutely what’s needed to push the technology forward. If you’re trying to train a neural network to drive, more data, under all sorts of conditions, is exactly what you need. Tesla uses this data to assess and improve its system all the time. Shutting them down would certainly set back the progress toward actually driverless cars. But is it fair to use the general public as opt-in Guinea pigs for their testing? And how fair is it for the NHTSA to discourage other companies from entering the field? We’re at a very awkward adolescence of driverless car technology. And like our own adolescence, when we’re through it, it’s going to appear a miracle that we survived some of the stunts we pulled. But the metaphor breaks down with driverless cars — we can also simply wait until the systems are proven safe enough to take full control before we allow them on the streets. The current halfway state, where an autopilot system may lull the driver into a false sense of security, strikes me as particularly dangerous. So how do we go forward? Do we let every small startup that wants to build a driverless car participate, in the hope that it gets us through the adolescent phase faster? Or do we clamp down on innovation, only letting the technology on the road once it’s proven to be safe? We’d love to hear your arguments in the comment section.